Meet The Secret Bookers, a three-generational book club, who've discovered that good food and good conversation, plus occasional telephone chats with authors, makes for a winning formula that's kept their book club fresh for more than 4 years! BookBrowse interviews Meet The Secret Bookers, a three-generational book club, who've discovered that good food and good conversation, plus occasional telephone chats with authors, makes for a winning formula that's kept their book club fresh for more than 4 years! about all aspects of their book club. Hello Theresa, thanks for joining us to chat about your book club. Firstly, can you tell us your club's name and how it got started? 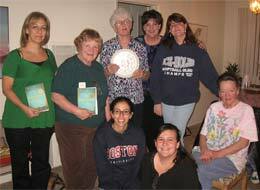 My mom, Colleen, and I started this book club about 4 1/2 years ago. We meet on a Tuesday evening every 5 weeks. I think the thing about our group that makes us unique is that we have a wide age range – we range in age from 30 – 75. Because of the wide age range (we have 3 generations in our group) we are able to get different perspectives and thoughts about everything. It really is just an awesome dynamic. Not pictured: Linda, Teresa and Kris. At our second or third meeting we all came with a name we liked for our book club. I don't remember who came up with the name, but when someone said "The Secret Bookers", it just kind of clicked. How many members do you have and would you say the group has a "personality"? Right now, there are 10 full-time members and 1 member who joins us for about 3 months every summer. Separately, the members of our book club have somewhat different personalities – everywhere from quiet and shy to loud, out-going and involved in everything. As a group though, I would describe us as fun and easy-going. We look forward to getting together every 5 weeks to discuss our latest book and really enjoy each others company. What we like most about being in a book club is the opportunity to read books that we would never pick up ourselves. Each member has a different taste, so by reading these different genres, it really expands our personal libraries and lets us explore literature we probably never would have picked up to read otherwise. Do your meetings follow a particular format? Our group meets once every 5 weeks. Each member is assigned a meeting that she will be responsible for – that means she chooses the book and hosts that meeting. The person who is hosting the following month's meeting is the moderator for that meeting (that way the host doesn't have to do everything!). The moderator is in charge of setting the pace for the meeting. Most books have a discussion guide these days, so it's easy to find questions to get the conversations going. No meeting is the same – each one has its own way of making itself unique. What about administrative side of things? I have taken it upon myself to organize everything for our book club, and I love it. I schedule the meetings, enter contests for free books and author phone chats and keep everyone up to date through e-mail. What's the ratio of book chat to social chat? Our meetings usually begin and end with the social chatting – how can they not? However, once the moderator starts the meeting, we usually end up spending at least an hour, usually more, discussing the book. This seems like such a silly question – especially for our group. Of course food is an important part in our meetings. As a group, we decided it would be fun to try to serve food that was in the book, or at least try to stick with food that is from the country/state/area the book is based in. For example, at our latest meeting, we were discussing The Inheritance of Loss by Kiran Desai, and our host had an Indian feast (it was delicious!). Not all books have food in them though, so we have also had meetings where pizza and salad have been served. There really is nothing better that a group of women, sitting around with some good food and some good wine discussing a good (and sometime bad) book. So, what sort of books do you read? With every member having her choice of one book throughout the year, we have a wide selection of books that we read. We have read everything from classic literature to contemporary fiction to non-fiction books. Any that stand out as having generated interesting discussions? The Secret Life of Bees by Sue Monk Kidd, East of Eden and Grapes of Wrath by Steinbeck, and Life of Pi by Yann Martel. There have been many we have enjoyed – these are just a few of our favorites. Any books that didn't go down too well? Story of an African Farm by Olive Schreiner and 20 Years in Hull House by Jane Addams were both very hard reads for our book club. Do you have any events that are special to your book club? Every year, our December meeting is our "special meeting". We have a regularly scheduled book club meeting, and afterwards have our "Yearly Gift Exchange". Each member brings a wrapped ornament that represents one of the books we have read throughout the year. We pick the gifts at random and then open them one by one trying to figure out what book the ornament represents. Colleen makes book nameplates for each member every year so we can label our book club books with our book club labels. You mentioned that you've arranged phone chats with authors. How did that go? Because I get us into so many contests, we have been very lucky with this. We have had 2 in-person author meetings (Miles Corwin for Homicide Special and Adrienne Ashford for Strrr-ike) and at least 10 author phone chats. Some of the phone chats include Tim Farrington for The Monk Downstairs, Michael Perry for Population 485 and Off Main Street, John Searles for Strange But True, Marya Hornbacher for Center of Winter, Lorna Landvik for Oh My Stars and Nicole Galland for The Fool's Tale. And….thanks to BookBrowse.com, we will be meeting Alan Brennert in June to discuss his book Moloka'i. All of the authors we have talked to and met have been so nice and really love talking to book clubs about their books. What do you do if you enter a giveaway and win books, or a book chat, but your group's not interested in reading the book? Being a member of several different book club websites, we have won phone chats/book giveaways that we did not necessarily enter. When we win one of these chats, I leave it up to the book club to decide if we have enough people willing to read the book and meet to discuss it with the author. Although we have accepted most of the invitations offered to us, there have been several we have turned down. I hate turning down the opportunity to talk to an author or the offer of free books, but I politely respond back to the publisher/book club website that our group isn't able to take advantage of the opportunity they have given us. What do you think of BookBrowse's Invite The Author* program? Is there anything we can do better/different? I love your Invite the Author program. I think it is perfect and wouldn't change a thing. So far, I have contacted 2 of your authors and both were more than willing to talk with us about their books. The first author was Marsha Mehran for Pomegranate Soup - this was a fun meeting because everyone in our book club was responsible for making one of the recipes in the book and when we were talking to Marsha she was very flattered at us having made her food such an integral part of the meeting. The second author, as I've already said, is Alan Brennert for Moloka'i. When I wrote to him letting him know we would be reading his book for our June meeting and would love to talk to him about it, he responded quickly and said he'd love to. He even said since we weren't far from where he lives, we might be able to do an in person meeting. Either way, we are looking forward to reading his book and talking to him about it - whether by phone or in person. *BookBrowse's Invite the Author program, available to BookBrowse Members puts BookBrowse members in direct contact with authors who they can invite to chat at their book club meetings by telephone. Is it a challenge to keep things fresh after 4 years? Although I can see why this may happen in some book clubs, we have not yet had to deal with this issue. I think because we all contribute to the book choices and hosting meetings, it doesn't get old for anyone – we look forward to our turn to choose the book and planning the menu for the evening, we look forward to moderating the meetings. Everyone has an equal say in all that we do and I think that is the key to our success as a book club. Do you have any final tips to pass on to other book clubs? Just have fun! Switch up the types of books you read – a variety of reading material makes for better, more interesting conversations and discussions. Appreciate each book (even when you don't like it) and enjoy your time together at every meeting.